I love my customers and users at Browserling so my team and I launched a public support forum a little while ago. Everyone is welcome to participate, even if you're not a Browserling's user. I love my blog readers, too. 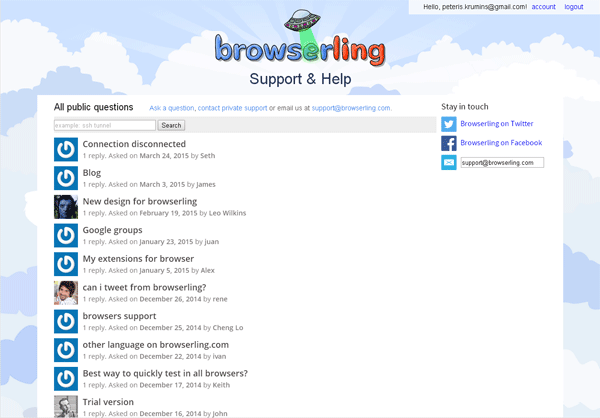 Browserling's public support and help forum. The implementation was very straight forward. We created two database tables – one for discussion topics, the other for answers. The main support page selects all visible topics from the discussion topics table and renders them as html. When you go to a particular discussion topic, the answers get loaded from the answers table. Being in touch with your users and solving their problems quickly and efficiently is something that every company should focus on. We strive to be excellent to our customers and users at Browserling.